With the recent release from Disney's Vault of the timeless classic Bambi comes renewed interest in all things to do with the movie. I was curious about who voiced Thumper and went looking for a bit of information. 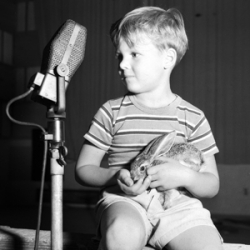 I discovered that Thumper was voiced by a four-year old boy named Peter Behn. Walt Disney hired him to voice the rabbit and, according to a documentary film included in the Bambi Diamond Edition release, Behn's voice was just the way he spoke. The director simply read the lines and Behn said them back. Apparently, they treated it as a game and Behn was a natural at playing the game. Thumper was Peter Behn's only voice role but, because of the success of the 1942 animated film Bambi, Behn lives on in motion picture history. Peter Behn is an American who was born in 1934 in Arizona to parents Harry Behn, who was a screenwriter and children's author, and Alice Behn. After his role voicing Thumper, Behn's family moved away from Hollywood and he went on to enjoy a normal childhood. Join us on this page, as we celebrate Peter Behn's Thumper. Bambi and Thumper Meet On The View - Would you believe that the children who voiced Bambi and Thumper met for the first time only recently? Would you believe that the individuals who voiced Bambi and Thumper only met recently? That's unbelievable! I am surprised. Interesting that they made the movie without these two important voices being together. That's how movies are made! Peter Behn auditioned for the voice of Bambi but his voice was deemed wrong for that role. Walt Disney's Bambi: The Story and the Film, written by Ollie Johnston, Frank Thomas and the Walt Disney Company is an insightful look at the story of the movie from its creation to its release on videotape in 1989. The authors, who were Disney animators working on Bambi, share what it was like to work on this Disney project, which started in 1936. 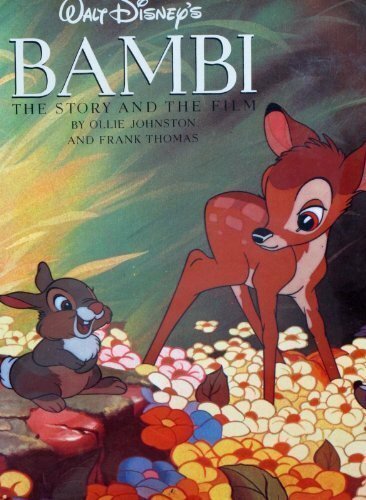 If you love Bambi, you should own this book as well as a copy of the recently re-released movie on blu-ray disc. Amazon customers clearly enjoy this book and praise it, one saying that it is a "detailed, technical book about this Disney character" and another that it makes a great gift, particularly for those interested in Disney history and animation. It's an older book, published in 1990 and as such is available used at a fairly good price. Even a 'new' copy is within reach. I see many new copies available for under $50. 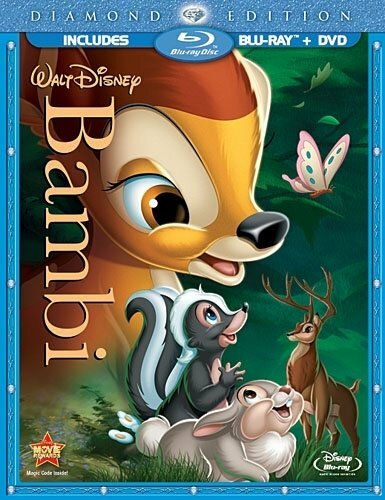 Click here to buy Walt Disney's Bambi: The Story and the Film on Amazon. The Toronto Sun on Donnie Dunagan who voiced Bambi and Peter Behn who voiced Thumper. Learn more about Peter Behn on Wikipedia. Learn more about the re-release of the movie Bambi. Find out what movies Disney has released from the vault recently. Jim Shore's figurines interpret Walt Disney's work in a light and playful way. This version of Thumper measures approximately 3.75 inches and I think it does a brilliant job of letting Thumper's personality shine out. James Baskett is the actor who played Uncle Remus in Disney's controversial Song of the South movie. Learn more about Mr. Baskett here. The evil queen from Snow White lives on...learn who voiced this, one of Disney's greatest villains. Ever wondered about the woman who was the inspiration for Walt Disney's Snow White? Learn more here. Who voiced Snow White? Find out here! This plush version of Disney's Thumper is one of the most popular on Amazon and is generously sized at about 16 inches. Guaranteed to remind you of your favorite movie, Bambi! Curious about Disney's Vault? Learn all about it and what movies Disney is releasing from it here on this page. Find out what the world thought when Disney removed Snow White and the Seven Dwarfs from the vault, remastered it and released it on blu-ray disc. Beauty and the Beast is an amazing Disney movie. Find out how the blu-ray version was received. Bambi is Walt Disney's fifth animated classic movie. Learn more here on this page. A page full of new, used and vintage Disney-themed gift ideas! Did you know who voiced Thumper? Doesn't doing so sound like a grand adventure for a little boy? I am fascinated by the history of the movies. Thanks for the visit, Rachel! Everyone's favorite Disney movie! It was interesting to find out that a little 4 year old boy voiced the part of Thumper. Nice hub and interesting. Voted up. What an amazing part of his life he has to look back on! And what a wonderful idea to get these two together at last. Very interesting topic, Brenda!